If ever there was a car which spanned two countries, it was the Austin A90 Atlantic. Both Austin and Pontiac emblems adorned the A90's bonnet. Built in Longbridge, England, it was one of the cars blazing a trail out of the post-Second World War slump. The Austin Atlantic was the first British car built primarily for the American market. Sadly, its trans-oceanic mission would fail. Stateside, they were used to 6- or 8-cylinder engines. So the A90's 4-pot tally did not make the cut. When an Atlantic broke 63 stock-car records in a week at Indianapolis - and sales still did not pick up - it was clear the American Dream was not going to come true in this case! As the A90's foray into stock-car racing had proved, it did not lack for performance. The Atlantic was one of few post-war cars good for 90mph. It was practical, too. Petrol was still being rationed in '48. The A90's fuel consumption was a valuable 25mpg. Its in-line four motor made 88bhp - rounded up to 90, hence the car's name. Peak power kicked in at 4,000rpm. Top torque - all 140lb/ft of it - arrived at 2,500rpm. Four speeds could be selected on the American-style steering-column shift. Just 7,981 Atlantics were built. Of those, a mere 350 made it to America. But back in '48 - when the A90 took the Earls Court Motor Show by storm - Austin must have been sure they had backed a winner. The new convertible came with all mod cons. As well as a power-hood and -windows, there were an Ecko radio, adjustable steering-wheel, and heater. 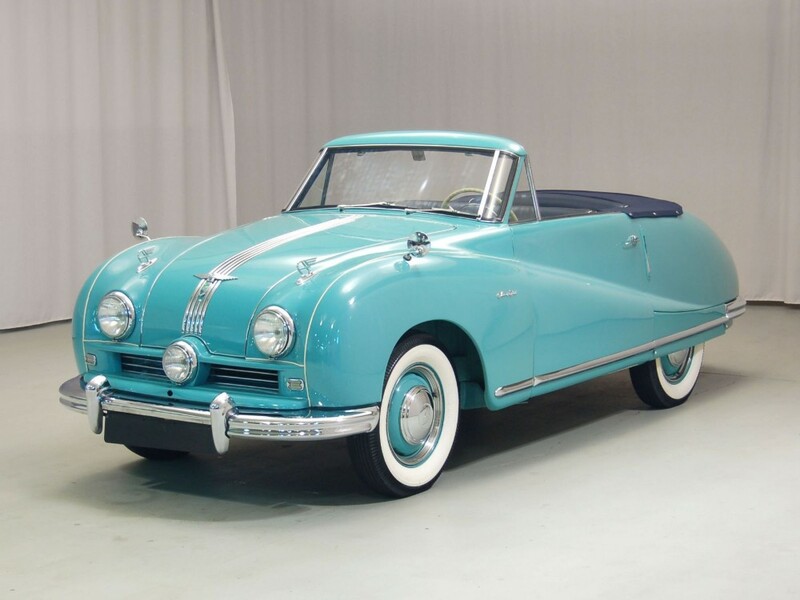 But as soon as 1951, it was the end of the road for the convertible version. The saloon car followed suit in '52. And that was it for the Atlantic. 'Special relationship' there may be ... but there are some things the UK and USA do differently. The Austin A90 Atlantic was an admirable automobile in many ways. But - to crack the States - four cylinders were never going to be enough!